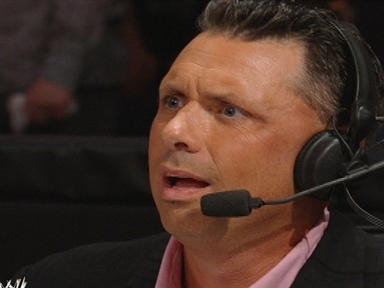 When I logged into Twitter last night, the topic IWantWrestling was all over my timeline. It was mostly due to TNA Impact airing at that time. Most of the tweets were about how TNA wasn’t giving the fans what they wanted to see. Reading the comments got me thinking not about what I wanted from a wrestling promotion, but rather what I don’t want in a wrestling promotion. These are gimmicks, matches, storylines, etc. that I feel need to be changed, put into hibernation or simply done away with for the year 2011. General Managers: I touched on this in a previous post, but I am sick and tired of the general managers. In my first twelve years of being a wrestling fan (1984-1996) there were no general managers. 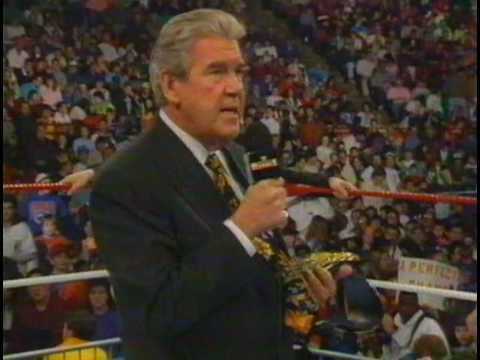 Sure you had WWF President Jack Tunney, and WCW had a board of directors, but they only showed up when needed. Their lack of appearances made their appearance mean something. And they were usually non-biased in their laying down the law. Ever since Eric Bischoff was revealed as the key player behind the scenes for the NWO and Vince McMahon was formally recognized as the owner of WWF/WWE, you can’t escape the general manager. Seriously, how many GM’s have Raw and Smackdown had since the brand extension took effect? Why do WWE and TNA feel the need to have an onscreen presence controlling the events? It leads to too much talking during the shows and pointless backstage segments. Wrestlers Showing Up During the Show: Maybe I’ve worked on the wrong shows, but when I was working on a live weekly show, if I showed up halfway through the show I probably wouldn’t be working on the next episode. Why are the top tier wrestlers allowed to show up well after the show has begun? When Hulk Hogan first showed up on Impact, I had mentioned to my friends one of the worst things TNA could do was wait until the start of the second hour of the show to have Hogan make his first appearance. Not only did they wait until the second hour for his debut, but also they had him on the way to the show during the first hour. If the new “boss” doesn’t care to show up at the start of the show why should fans care about anything or anyone outside the main event? Ref Bumps and Run-Ins: This mainly applies for TNA title matches, but it should apply to all matches. Nothing is more aggravating then having a good match ruined by unnecessary shenanigans. I don’t understand why, but TNA seems to think the only way for an important match to end is with as much confusion and nonsense possible. What is wrong with one guy simply pinning his opponent? As I talked about in my post about Champions, when a wrestler can’t win a match on his own, fans won’t view him as a star. Tag Team Ref Clichés: Anyone who’s seen more than five tag team matches knows what I’m talking about. If the good guys make a tag the referee doesn’t see he’ll not acknowledge it and make the fresh guy get back out of the ring. Five seconds later the bad guys will switch without tagging behind the ref’s back and the ref will allow it. That’s just one example. The bad officiating clichés are beyond played out. Pay Per View Opponents Wrestling Each Other on Free TV: If you want me to pay to see two guys fight, why are you having them wrestle before the pay per view? Or if I just paid to see guys fight and on the next show there’s a rematch, why would I pay for the next pay per view? I’ll wait and see the match for free. Storylines Based on Real Life: Contrary to what Vince Russo thinks, storylines based on wrestler’s real life issues aren’t interesting. Take the current TNA angle of Kurt Angle/Jeff Jarrett/Karen (Angle) Jarrett. Who cares about their love triangle? How many fans knew about it to begin with? When writers start booking based on real life usually it’s more depressing than exciting and it shows you a side of the wrestler that as a fan you probably don’t want to see. How many times as a real life storyline been based around something positive? How many have been based around addictions or behavior that shouldn’t be glorified? Face/Heel Turns With No Reason: Going back to my Open Letter to TNA, there was a time when a turn meant something. Now days a turn just means it’s another week and another show. Bad Commentary: Watching Raw or Impact can be made better by hitting the Mute button. Storylines that have No Planned Ending: I feel TNA had no idea who “THEY” actually were until 10-10-10. (And if they were THEY all along, that’s even worse) And I doubt WWE knows who the Raw GM will turn out to be once the computer is gone. How many authors, screenwriters, newspaper writers, etc. start writing a story without knowing what is going to happen in the end? Why does it seem so difficult for wrestling writers to come up with a compelling story that makes sense? The Same Guys on Pay Per View Month After Month: Both WWE and TNA have huge rosters. So why is it the same 10 guys are involved in every storyline? Just because there’s a pay per view in three weeks doesn’t mean two guys who suddenly have a problem with each other need to fight at that show. Wait until the next show so there’s time for the hatred to bloom. Any NWO or Montreal Screw Job Type Angles: Can we agree there needs to be a moratorium put on these two ideas? Yes Nexus started off strong but quickly ran out of steam due to Nexus being constantly punked out by John Cena. The Montreal Screw Job happened over 13 years ago. Most of today’s WWE audience probably wasn’t alive when it happened. It’s time to move on and come up with something new. Stop trying to recapture the Monday Night Wars/Attitude era by rehashing everything from that time. Create something new to capture the audience’s attention. And if you can’t think of something new, step aside and let someone else take over. Those are just a few of things I don’t want to see in wrestling this year. What do you not want to see? Send me an email, I’m curious to hear your thoughts.